Looking for a Veterinarian in the Clinton, MS area? We would certainly like to serve you and your pet. 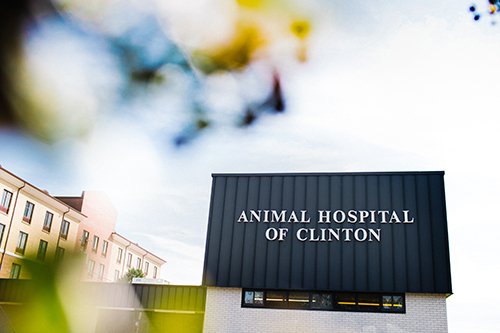 The Animal Hospital of Clinton was established in June of 1994. Dr. Gill moved to Ripley, TN after graduation and practiced at a Mixed Animal Practice - Lauderdale County Veterinary Clinic for 6 years. He was raised in the Edwards area and wanted to return to Mississippi to raise his family. The location he chose for his practice was an old convenience store located at 497 Springridge Road. The old store was converted into a Small Animal Hospital to be used for medical services, general surgery, dental and boarding capabilities. In 2005, the building was renovated and additional boarding facilities were added. The office now has 3 full time veterinarians. The Animal Hospital of Clinton is now proud to also offer in-house diagnostics, laser surgery, and laser therapy along with the regular medical and surgical services. If you are planning a vacation, extended medical leave or even home remodeling, how about having your pet stay in our comfortable affordable boarding facility? Animal Hospital of Clinton has separate boarding areas for dogs and cats, ensuring a peaceful environment for both. One of the most useful tools in all of healthcare, whether animal or human, is the use of radiologic technology. In general terms, this means x-ray technology. The latest techniques are used by Animal Hospital of Clinton in the surgical aspect of our animal hospital. Laser is used in surgery to decrease scar tissue, improve healing, and make more accurate incisions and removal of masses or tumors. One of the most overlooked aspects of animal health is dental health. Dr. Gill and the staff of Animal Hospital of Clinton have great expertise in this area and are eager to treat pets and educate their owners on proper dental care. The newest technique used by AHOC to treat wound healing and chronic pain is Laser Therapy. Laser Therapy uses “pockets” of laser energy to stimulate cell re-building at the most basic levels.